Opened in December 2014 our estate agents in Manningtree serves the picturesque countryside of North Essex and South Suffolk. The Stour Estuary, the rolling countryside of Constable Country and the historic Towns and Villages surrounding Colchester are the enchanting backdrop to our latest office. Situated in the heart of the conservation area of Manningtree the modern and light contemporary fitted office offers a welcoming environment that residents, commuters and day trippers alike can pull up a chair and have a coffee in a relaxed environment to talk about their individual property needs. With many competitors embracing the model of internet only we continue to see the value in helping people fulfil their property aspirations face-to-face particularly when it comes managing the sale or let of what usually is our clients most important asset. Our window display is striking with vibrant and uncluttered A2 and A3 backlit displays on printed film often catching the imagination of those who frequent our high street location. In the office you will find well known Manningtree company directors and trusted property professionals Tracy Churchwood and Darryl Stanley alongside Alfie the Tibetan Terrier. Tracy has founded our residential rental and property management business to compliment the already very successful sales business. 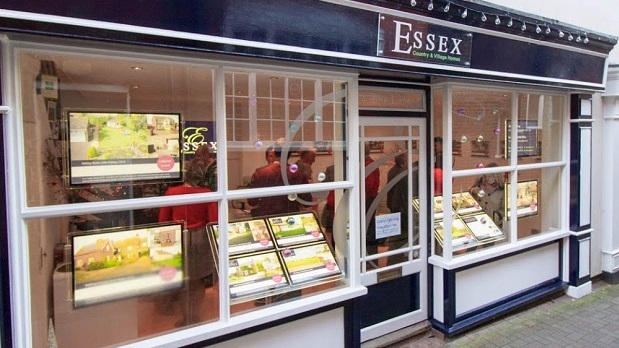 As well as past estate agency sales experience with a National agent and Essex Country & Village Homes, Tracy has spent the last six years as the Lettings Manager for a highly reputed regional firm. Prior to entering into a career in the property market, Tracy spent most of her working life commuting to London, working for various large financial institutions in management operations and accounting. This with her past lettings and sales experience ensures that every attention to detail and regulation is upheld in all of our rental operations. Darryl has served as sales manager for Essex Country and Village Homes in Thorpe le Soken for the previous seven years and has sold many bespoke properties in that time from one bedroom Tudor Cottages through to more decedent estates such as Old Hall in Mistley and Ramsey Windmill. No job is too big or too small and Darryl prides himself on providing a consistent level of customer satisfaction no matter what the property or whom the client. Darryl’s previous background is as an award winning Human Resource Management graduate and as a central training manager for one of the UK’s largest catering groups. As company director of Essex Country and Village Homes in Manningtree he has no doubt that there is no other role best suited to his people and property passion.